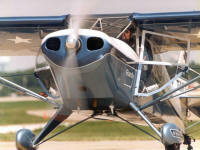 The Texas T-Cart is a highly modified, clipped-wing Taylorcraft BC12-D, and first rolled off the assembly line in 1946. 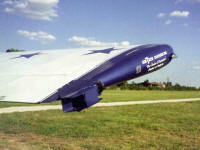 Randy spent two years modifying this home built taildragger in his hangar at Cotton Patch Aerodrome in Frisco, Texas. 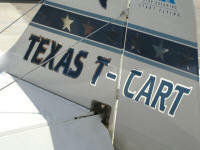 The wings of the Texas T-Cart have been clipped eight feet for a total wingspan of twenty-eight feet, and the engine is an 180 horsepower Lycoming. It also has both an inverted fuel system specially designed for aerobatics and a smoke oil system that Randy uses during all of his air show performances. 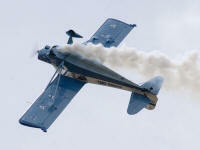 Texas T-Cart Airshows offers competition style aerobatic demonstrations and truly exciting “Texas Style” air show performances. During our crowd-pleasing shows, the Kid from CottonPatch performs three truly unique maneuvers at air show center: The Texas Two-Step, the Texas Turn, and the Texas Touchdown. The Texas Two-Step is a fishtail hammerhead that makes the T-Cart’s tail swing from side to side as it “dances in the sky.” The Texas Turn is an original maneuver. Randy turns his airplane 360 degrees without banking the wings, and he is the only pilot on the air show circuit who knows its secret. After his flight, our championship pilot comes down from the sky with his Texas Touchdown – an exciting one-wheeled landing – as the Texas T-Cart blows clouds of smoke down the runway. Our “Texas Style” airshow ends with a song, as Randy honks the Texas T-Cart’s horn, gets out of the airplane and kisses the ground.